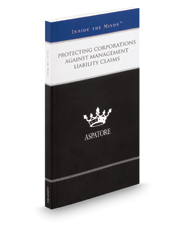 Protecting Corporations Against Management Liability Claims provides an authoritative, insider's perspective on key tips for helping clients avoid and address potential policy violation issues. Experienced partners from law firms across the nation guide the reader through the process of staying educated on state law and updating company policies to effectively prevent liability claims. These top lawyers offer specific advice on preserving evidence related to allegations, helping clients learn their statutory protections, and coordinating defenses with other parties. Covering a range of issues, from maintaining accurate performance evaluations to identifying potential liability risks, these experts stress the importance of educating clients about implementing mandatory employee compliance training and how to handle an investigation if one should arise. The different niches represented and the breadth of perspectives presented enable readers to get inside some of the great legal minds of today, as these experienced lawyers offer up their thoughts on the keys to success within this dynamic field.